This timepiece features 2 different time zones that are displayed at all times on the dial, keeping you aware of your home time while your travel. 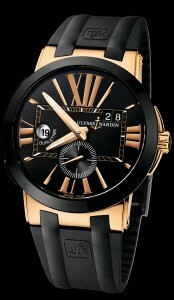 It is an 18K rose gold, 41mm case, automatic movement, big date and features a glass exhibition back. The second time zone by the 9 (which reads 19:00 hours) is easily adjusted by pressing a button (located on the side of the case. Shown on a sporty black rubber strap with a black ceramic folding buckle.